My Hero Academia is probably one of my favourite shonen animes of the year and the video game adaption as a fighting game was something highly anticipated from fans of the manga and anime. My Hero One’s Justice ends up sticking up a decent fight as a fighting game but read our review to see if it’s an instant KO or a close call. If you are not aware of the manga or anime series then My Hero One’s Justice is centred around a world that up to 80% of humans have special powers known as “Quirks”. They can range from basic things to full on superhuman abilities, with the cream of the crop going on to learn to be “heroes” which work alongside the police to protect citizens from the bad people who use their Quirks to be villains. It takes the storyline as the same in the anime, following Midoriya, a once quirkless individual with no powers through his journey to be a hero after being granted powers from the No.1 hero All Might. My Hero One’s Justice is a 3D battle-arena fighting game which has some nice visuals and matches the anime style quite nicely. Usually, the battle consists of one v one matches in environments that tire into the story mode scenario but are fairly confined to make sure you fight rather than run away. With the destructible environments to it adds a little more to fighting as with Quirks in My Hero Academia being quite overpowered, it makes sense a lot of damage is going to take place. Combat compared to other fighting games could be described as toned down. Instead of having a wide variety of combos that you can use to build up specials you have three basic move-sets; standard attacks, special attacks and throws/grapples known as unblockable attacks. Your normal attacks are what you build up your main combos, while your unblockable attacks are usually things like grapples or stun based attacked, useful for when you enemies are guarding. Special attacks are useful for smashing through normal attacks while delivering a powerful counter back. On top of attacks, there is also additional movement based moves such as jumping, dashing etc which add more of a vertical layer to fighting. Some characters do much better in the air than others which can change battles a little depending on how quickly they can combo in the air. When you add in the character Quirks as well, there are a lot more combinations that you can have. Todoroki, for example, can stop his opponent’s movements with ice and blast them back with a combo of fiery attacks. While Midoriya is more about speed and fast attacks being able to also attack from a distance using powerful shockwaves from his punches. While Iida can dash around the battlefield and using his feet can attack devastating kick combos. It makes it all fit in with the show really nicely and fans of the show will love being able to play as their favourite characters. In the show, everyone has their own unique traits but the action is powerful, quick and you can feel the punches. My Hero One’s Justice is able to nail this really well in the 3D arena. Characters such as All Might feel absolutely unstoppable while quicker characters like Ilda outrun other slower characters that are more about defence. Each really feels their own in battle and you can have a lot of runs trying out the different characters. Even the more unnatural characters like Tsuyu Asui are fun the play as darting around the arena attacking from a distance. There are two different modes of fighting, normal or manual. Normal mode is the default and will basically chain your combos for you allowing you to mash one button and let your character do the rest. Manual will allow you to create your own combos with the combo system but really I don’t expect many people will do that. Normal combo move-sets are quite good and as it is the default setting most people will just naturally fall back to that. Playing through the story mode sets up around halfway through the second season of My Hero Academia ending half-way through season 3. Fans of the show will enjoy the story arc as it is one of the better ones from the show. Understandably though, newcomers to the series will feel a little lost as a lot of the character setup happens in the first season that My Hero ONe’s Justice has completely skipped over in favour of the more action-packed story arc. Sitting the story right in the middle though does seem like a strange move, as it does not really sit well for both new and old, even if the older fans will enjoy it. It ends up segregating newcomers to the series, while not offering anything different from the veteran fans that they have not already read in the manga or watched in the show. Ideally, it would have made more sense to go down the route that Black Clover: Quartet Knights did offering a completely new story that was able to be enjoyed by new fans and old alike. Mission mode though is fun to play for anyone and gives you six different maps where you can complete a wide range of different challenges. This helps you level up your character stats and getting them better equipment to use for the more tougher missions to come. There’s a real sense of progression for the characters you play as and add a lot more replayability than the story mode. As your progress carries over from fights, you need to plan your moves carefully and using items or buffs will decrease your overall score at the end making it a delicate balancing act of surviving and maximising point gain. Mission mode also really feels closest to the actual anime, where the characters would usually be put into three-man teams to battle against each other and complete objectives. Choosing your three characters allows you to see how each one works together or not, giving you better insight into their abilities. Finally, you’ll also be able to fight other players online but the servers have been a little hit or miss when writing up the review to be matched with other players. This seemed quite common with a lot of other reviewers who also looked at the game. Arcade mode is as the name suggests and just allows you to set up fights how you want between characters, giving you a good way to test new characters before hitting the online mode. In the end, My Hero One’s Justice is a lot of fun even if the story mode is a little disjointed for new players. As a fan of the show, it nails the different characters quirks in a fighting setting and the mission mode really lets you explore them in more depth adding a good layer of difficulty to the game and replayability. The online mode and story mode could have been better but there’s quite a bit of content for fans to enjoy and some good foundations to improve on for the next game if there is one. 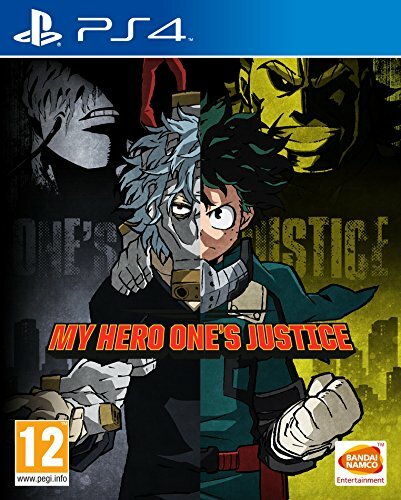 My Hero One's Justice is fun for new and old fans of the series but the story mode could have been better thought of. Mission mode is where the fun and challenge happens and give online-mode a go if you can get a match.